After taking some time off for a family vacation last week and giving myself a social media detox I am back and feeling totally refreshed! It was the first trip I have had with my husband in five years where we did not work at all and it was good for the soul! I am so excited to begin sharing more memories from our Marrakech trip. Traveling to Morocco was one of the best decisions we have ever made and truly the trip of a lifetime! It has always been number one of my bucket list and to be there and experience the culture, the colors, the food, the architecture, and everything else was something I will forever cherish! This Johanna Ortiz look was one I was most excited about, and wore to dinner at our Riad the very first night. 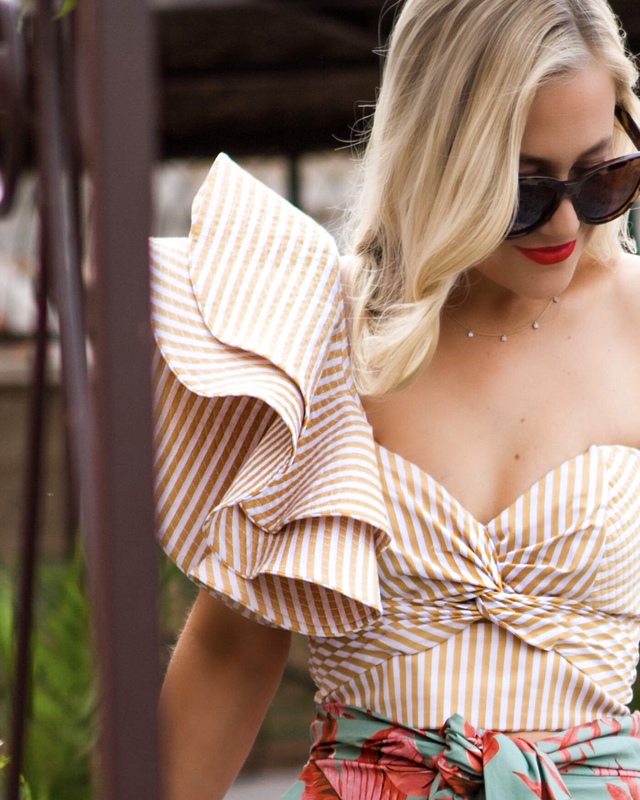 The bold ruffle sleeve top is the most incredible statement maker and I was so impressed to see how well it traveled. I paired the top with this printed midi skirt and was curious – do you ever mix and match bold prints? If not, I encourage you to do so! I love how bright and fresh this look turned out and will definitely be wearing it again. I made sure to share a similar look for less at the bottom of the post! What a great way to match prints in such a beautiful setting!